Now that we have access via the intertubes to a plethora of HD media, be it via Netflix, iTunes, Youtube, or your own downloaded video files stored locally, it’s become more apparent than ever that your computer, or even your mobile device, is not the best appliance to view these materials on. That’s not to say these devices aren’t perfectly capable of handling your media demands. Your computer can deliver streaming media perfectly well, and nothing beats a boring bus or train ride like a tablet device, a good pair of noise-cancelling headphones, and a season of your favourite TV show. But this is not the ideal way to consume this media. One thing we figured out long ago was the best way to enjoy films and TV is on a comfortable couch, surrounded by your friends or loved ones, snack in hand, and beaming forth from the centrepiece of most living rooms – the television. The mobile device is fine for a train ride, and the computer is great to check out the latest cat video (The king of which round our parts right now is this little slice of awesomeness here) for a couple of minutes, but for anything with any length to it, you are going to want to be observing in comfort. And while we are getting there, no one has quite got it right yet. There are plenty of devices to help you get online media onto the biggest screen in the house, but none of them are perfect. Apple TV works great, but the closed environment is frustrating to those who get their media from multiple sources. The Roku is a fine device, but lacks convenient connectivity with mobile devices, and the interface is a little ‘unpolished’. Most hard drive integrated boxes are clunky, slow and suffer from compatibility problems. And while it’s still not perfect, Google’s foray into this burgeoning field, the Chromecast is another step in the right direction. 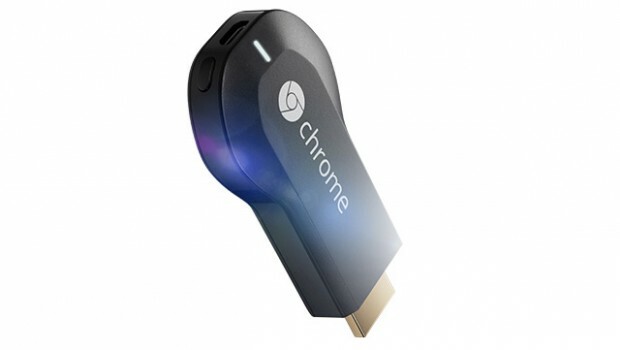 The Chromecast is a tiny device, similar in size to a USB stick, that plugs into the HDMI port of your television. 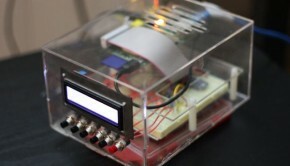 Connected to your home network and the internet via WiFi, it interfaces with your desktop, laptop or mobile device to stream media onto the TV. “Why,” I hear you say, “that’s just Airplay, innit?”. Well, sort of. But not quite. Unlike Apple TV’s airplay function, which allows you to beam content from your iDevice to the Apple TV player, the broadcasting function of the Chromecast is its sole purpose in life. And just to be even more different, rather than sending the content from your mobile device to the Chromecast, your device simply points the Chromecast to the address of the media on the network, meaning it goes off by itself and grabs the stream, playing back on your TV, leaving your mobile device or computer to get on with other things. The benefit here being it doesn’t tie up your device by requiring you to keep an application open to stream the media over. The Chromecast talks to your controlling device via a plugin that you install in Google Chrome, or via an app installed on your mobile device. While further functionality is being developed, right now you can stream a lot of popular streaming media services to the device, such as Netflix and Hulu, as well as sites with embedded video such as Youtube and its millions of contemporaries. Similar to Airplay (but less restrictively), you can also use Chromecast to mirror your web browser, allowing you to browse on the big screen, which would be great for presentations, or showing your latest reddit finds off without all your mates having to crowd around the laptop. So it’s a device that solely does an improved version of Airplay, what’s the kicker to get the finicky consumer over the line? The price. $35USD for a device that simply and elegantly provides the service that most Apple TVs are solely used for in a much more open and usable manner? Sign us up. Being tinkerers at heart, we’d be remiss if we didn’t mention at this point that a Raspberry Pi installation of XBMC can perform a similar function, provide much more versatility, and stream your local media flawlessly, for around the same price. But if the learning curve for a Pi based media centre is too steep, or you don’t currently have a media centre solution and just want to mirror and stream media simply and easily, the Chromecast fits the bill nicely. Edit 1: Well, from all accounts, the Chromecast flew off the shelves and is now sold out in retail stores. You can still pick one up on amazon here. Edit 2: The Chromecast sold out in minutes upon release, and those capricious hacker types have already got their hands on it – it’s already been rooted, and subsequently patched. It looks like the popularity of the device is going to lead to some very interesting developments in the streaming media field, for both for regular users and for those who like to delve under the bonnet of their devices. Stay tuned for more Chromecast developments!